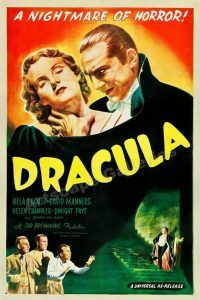 A ripple of applause rang out when the hammer finally went down on the incredible Style B Dracula poster that was offered in the latest Signature auction by Heritage. The buyer remains anonymous but what I do know is that the original owner was the historian Lt. Col. George J. Mitchell, Jr. who was an Associate Member of the American Society of Cinematographers. He had owned the poster since the 1950s until his family decided to place it into auction early this summer. 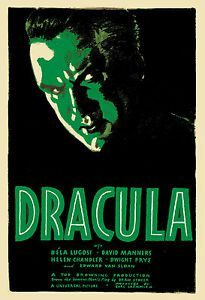 This got me thinking, with the Universal horror posters from the 1930s being the most sought after film paper by collectors, just how many copies of Dracula paper were known to the market? 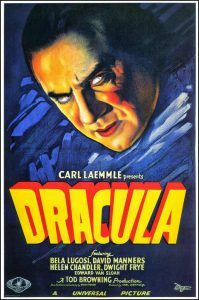 We know that Bela Lugosi‘s Dracula film has been released a number of times in America and I will focus on the release dates of the most valuable posters. These dates are 1931, 1938 and 1947. 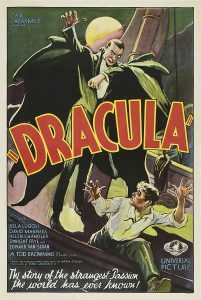 Universal released four 1sheet film posters for Dracula, these are known as the Style A, Style B, Style C and Style F.
The Dracula Style A is shown below, there is believed to be only two copies in existence. The Style B art shows a more sinister image of Lugosi as Dracula. Once again there are only two known copies. 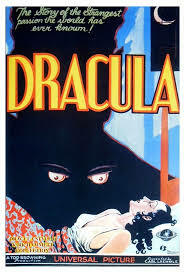 The Style C one sheet tells the story in just a poster, Dracula looming in the shadows peering at his prey, a wonderful design. Unbelievably there is only one known copy of this poster. Finally, there is the style F. The image just screams like it has come from a comic book. Amazingly there are five known copies of this poster. The film was again released in 1938 and to promote the film and this beauty was created. There is only one known copy of this poster. It is my favourite Dracula design, menacing and mysterious with fabulous colour. The 1947 release has an image which most horror fans will be familiar with. 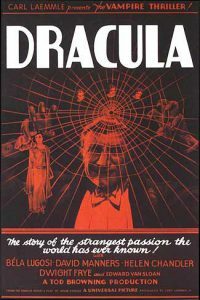 It is the most common of the Dracula one sheets with nine copies believed to be in existence. It would still be nice to own one but these very rarely come up for public sale. So here they are, all of the one sheet images from the three early releases of the film. I’ve mentioned that the 1938 release is my favourite, which one is yours?